Evolv, Inc > Categories > General Discussion > Early DNA75 mods issues ? Basically, the mod enter into weak battery error while the battery is fully charged, and some problem with ground turning the personnal vaporizer into a personal electrical stun stick. For the ground issue I guess it can be coming from the manufacturers, even though it's surprising that the two have done the same mistake, but the weak battery issue rather looks like a chipset issue. What's weird is that I haven't seen it mentioned in the few reviews available, anyone have seen these issues mentionned elsewhere ? The "weak battery" can easily be a result of voltage sag caused by the high current demand of the preheat. Looking at eScribe as I fire my DNA75 with an 18650 shows the voltage drop during preheat is really quite high and not an indication of a problem with the chip or the battery, just a result of a very high load. Even a 26650 will sag, significantly, under loads like that which, in turn, trigger the "low battery" warning. The chip just sees the voltage drop to the "low" threshold and triggers the warning. The shock thing is shocking, no pun intended, but as you say it is just something with that mod and I hope just some of the early versions, very strange though. On that mod there is something up with the battery connection and that would explain the Weak Battery message, I do note he gets it with another mod also. Weak Battery is a warning message and not an error, you get Check Battery when there is more of a problem. It just means that the battery couldn't supply the power you asked for without sagging below 2.5 V so the board protects your battery by backing off to keep it from dropping that low, which is a good thing IMO. You may get it a little more in temp mode with the preheat at 75 W, but all it means is you just get say 65 or 70 W preheat instead and mostly you will get full wattage for the rest of the vape, have a look in device monitor to see for yourself. 75 W is a lot from a single cell and the voltage from cells with high internal resistance will sag a little more, the high mAh cell that have got popular more recently and 26650s for instance. Also if the cells are really tired they take longer to recover than cells in good condition and you will see more warnings, info message would be a better term IMO. I am having no issues with VTC4s date codded Oct 2013 and 25Rs date codded Sept 2014, I am not running at very high wattage, but I do have the preheat maxed and get good performance from both of these batteries down to around 3.15 - 3.3 V before the vape drops off. Saying that I did get more warnings before I replaced the contacts on Keystone battery sled, inadequate wiring and battery contacts will make a difference too. If you get Weak Battery on a nearly fully charged battery I think it's because your battery, battery contacts or wiring are inadequate, when the battery is getting low expect to see the warning it's a heads up that you will need to charge or change the battery. The irony is that I bought a cheap 26650 mod before, to test a bit battery life on 26650 before investing more in a dna75, but it doesn't have any of these problems. So I guess it's bad components used in thoses mods. If you get warnings with fuller batteries running the 26650 than 18650 it's the battery, but both should be OK and I was just trying to include all the factors. If you do feel you are getting the warnings too early I urge you to look at the battery level in device monitor because it is probably jut the initial preheat that is triggering the warning and it may be an idea to turn that down a bit for that battery. 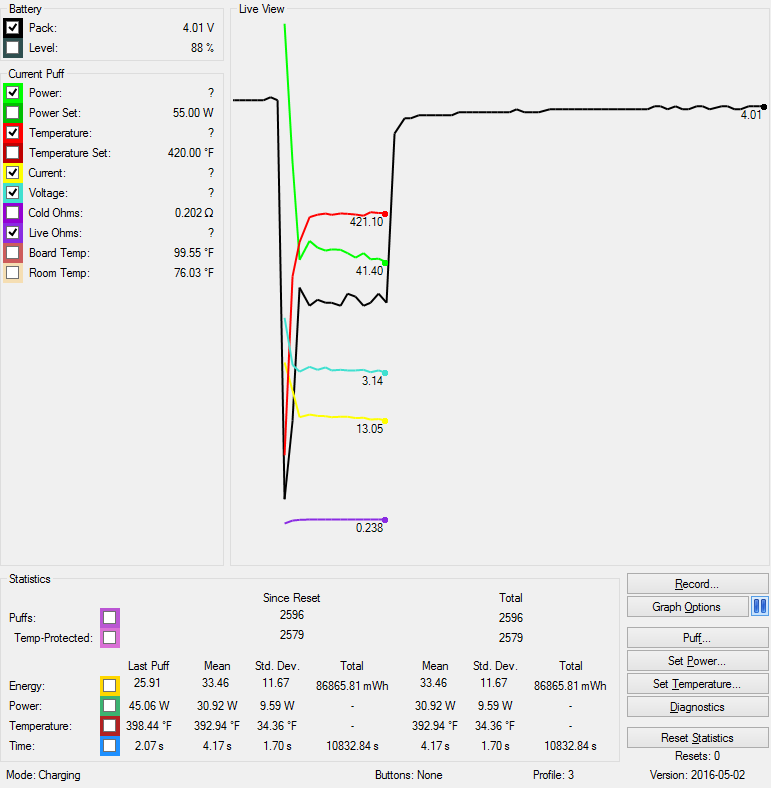 See the battery voltage is the black line, it sags a lot with the 75 W preheat, but quickly recovers as the power reduces to 40 W. This is a Sept 2014 Samsung 25R that has always been charged at 2 A so is by no means a top condition battery, I don't get any warnings until the resting battery voltages goes down to about 3.3 V with this set up. Just to clarify, I own none of these mods, I had the Hotcig on pre-order, but currently cancelling it after seeing this review. What you say makes sense, especially since the reviewer doesn't seem to have properly configured the mods using escribe, and probably pre-heats at 75W. But the battery weak message and cut-off seem to happen after the pre-heat time. Yes it remembers the battery dipped that low, it is a little little like the temp protected message as regardless of how long the condition lasted it will flash after the puff because you can't see the screen while vaping on most mods. If I recall correctly, he is trying to vape at 75 watts on a 26650 in this review. Everything I've recently read about 26650's states that vaping over 50 watts on a 26650 is going to be lackluster. I've heard sticking to 30-40ish watts is going to be the best performance. Just as a follow up to this thread, I bought an Hotcig DX75, never got zapped so far after one week, and the mod doesn't go into weak battery error when it's not pushed to its limits. I'm very happy with it. Thanks for the informations ! Fagen was shocked because the ground screw wasn't engaged in the bottom of the battery. I just uploaded the new update-look here-that fixes the check battery issue and it seems to be running smoothly so far. A thing to note is running the board upwards of 75 watt range will stress any battery. I'd say use 18650 for above 50 watts and 26650 for under. So far, the basen 4500 26650 isn't doing to bad and I've read running the battery analyzer improves it, which I plan to do this weekend. USB connection stopped working, I've tried on multiple computers with the included USB cable and others, and I can not connect to the PC. Simply not detected. This happened in a hcigar vt75, with 4 days of use!!! Is there an update for the board or the mod, if its the mod what mod are you using ? this small update from evolv which tweaks the "weak battery" message. here's the link, read through. Had this same problem with tons of strange error messages. Figured out it was just loose screw on the bottom. Tighten up and has been working like a charm since. But I damaged the bottom by over tightening the battery cover. It kind of bent the bottom case. Since its not a defect I can't claim warranty. Thinking of disassembling and bending it back.